The International Day of Peace is celebrated in September. British artists have decided to mark this date fully armed and will present an exhibition displaying various articles made from AK-47 assault rifles. Today not only can a way of artistic expression or a theme of a work of art become the base of an art project, but also the material used for creating pieces of art. The most well-known weapon in the world – the Kalashnikov assault rifle – will be the basis for 23 modern artists who will present their works at the exhibition opening for the International Day of Peace at the end of September. British artist Damien Hirst – infamous for his “For the Love of God” which is a human skull recreated in platinum and studded with thousands of diamonds, making it one of the most symbolic events of recent years and the most expensive project – supports the idea of the exhibition. It is still unknown what Hirst will show at the exhibition, but his name on the list of participants is a guarantee that the press and the world art community will pay close attention. The idea was conceived by photographer Bran Symondson, who served in Afghanistan not long ago. He gathered 24 decommissioned AK-47 rifles and believes that their “reincarnation” into works of art will make it possible to have a new look at the weapon, the goal of which has always been the destruction of life. Symondson says that he has tried to involve artists into group projects before, but they were not enthusiastic. This time, however, the idea to participate in a project marking the Day of Peace and the opportunity to work with the symbolic weapon appealed to the art world. 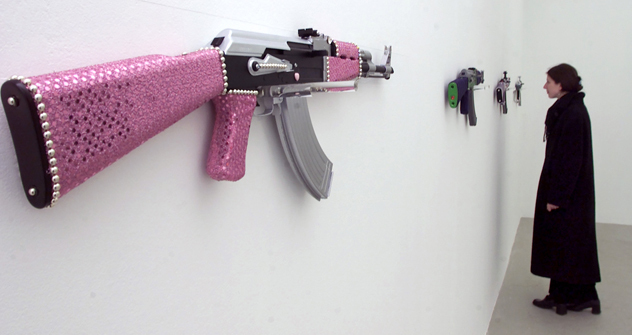 According to Symondson, artists today are apolitical, but they all loved the idea to create something out of rifles. The notion of using everyday objects withdrawn from their daily use in works of art is nothing new. The term “ready-made” which defines such art was introduced by Marcel Duchamp at the beginning of the 20th century. His concept was that displaying commonplace objects in exhibition halls reveals new meanings to onlookers. It is quite obvious that if the organizers of the project had failed to get Damien Hirst involved, the chance that journalists and art experts would get interested would have been small. For now the public is trying to guess what the scandalous artist will create this time: whether he will stick to his usual method and put an AK-47 in formaldehyde as he has done many times before with animals and fish, or present a glamorous version of the legendary rifle covered with gold and inlaid with precious stones?